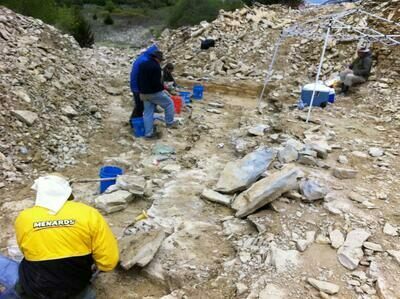 I get the chance to head out in the field pretty frequently to collect fossils myself. Before starting FossilEra I would take maybe three or four collecting trips a year, but now the job gives me a good excuse to do it a little more frequently. I thought it would be fun to chronical some of my collecting trips on this blog to give people an idea of the type of work that goes into finding specimens like some of those being sold on this site. 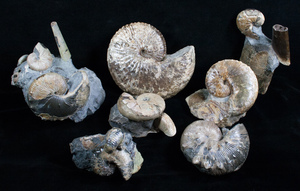 Last April I got an invite from Dan Cooper (a true legend in the trilobite world) to join him and a group of about a dozen other trilophiles down on his lease in the Haragan Formation of Oklahoma. The Devonian aged Haragan Formation, produces arguably the most beautiful and highly detailed trilobites in the United States. It has been famously collected by Bob Caroll for over 3 decades at “Black Cat Mountain”. Dan’s lease was basically one hill over from Bob’s lease at Black Cat Mountain. 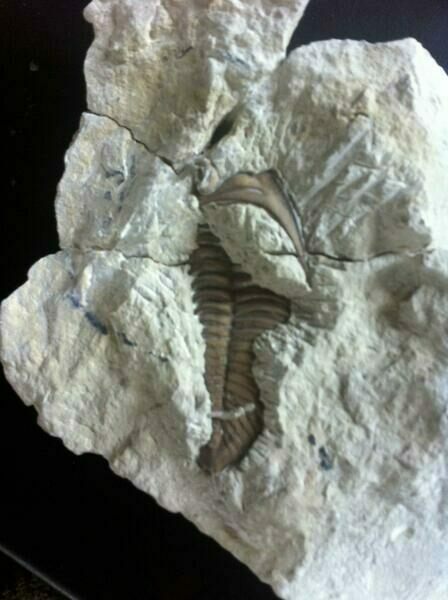 See Oklahoma trilobites for sale on FossilEra, many collected and prepared by Bob. Prior to the trip, Dan brought out heavy earth moving equipment to expose a section of the most productive layers in the formation. 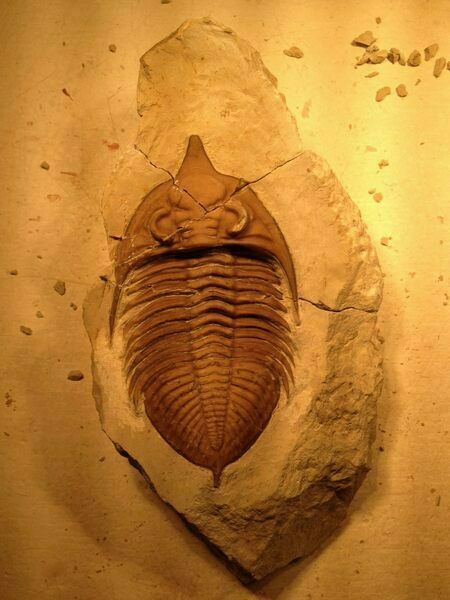 While the Haragan Formation and the overlying Bois d' Arc formation are well over 100 feet thick, complete trilobites are only relatively common in certain layers. 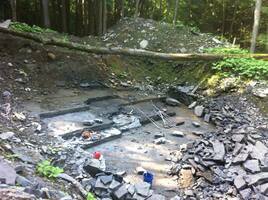 A backhoe was used to remove 10-20 feet of solid rock down to just above the start of these productive layers. We spent the first day and a half of the collecting trip removing the final few layers of marlstone above these by hand using large pry bars, wedges, and a 20 lb sledge hammer. 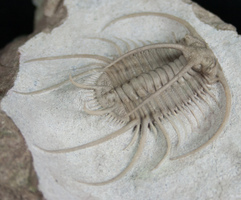 While trilobites can be found exposed on the rock surfaces, they are typically not well preserved either having much of their shell weathered away or being more squished rather than three-dimensional. Getting high quality trilobite specimens requires breaking the rock into progressively smaller pieces and carefully looking for a thin cross-section of a broken trilobite. 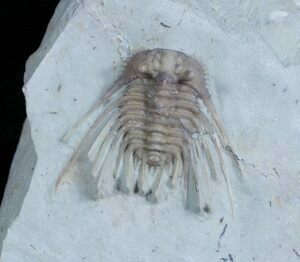 While it may sound counter intuitive to get the best preserved trilobites, you hope to break the fossils cleanly in half. They can then be glued back together in the lab and the surrounding rock carefully removed under microscope. 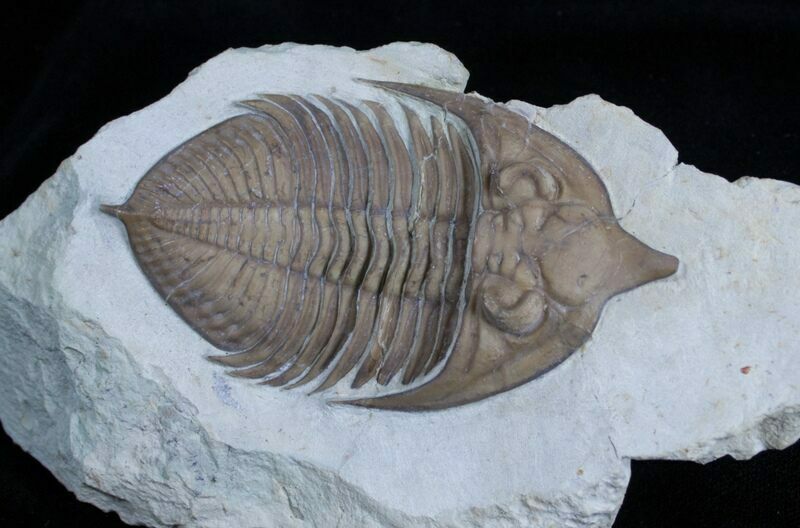 Even to experienced eyes, seeing and identifying trilobite cross-sections is very difficult. Throw in the fact that the rock contains lots of trilobite fragments, brachiopods, corals etc and this task gets even harder. Often you need the sunlight to be at just the right angle to be able to see cross sections at all. Sometimes you’ll find yourself finding lots of trilobites early in the morning or in the evening when the sun is at a low angle and then very few when it is directly overhead. The most experienced collectors can determine species, likely orientation, size and chance of being complete. While we roughly cracked the overburden layers looking for cross-sections, they yielded very few complete trilobites. I had some excitement when I split through the head and first segment of what I thought could be a monster Huntonia trilobite, possibly 5-6 inches long. Typically you just find heads or tails of these trilobites, but given that I could see one segment in place there seemed to be a sliver of hope it could be complete. Alas after hauling the 20 lbs of rock back it was encased in on the plane and doing some exploratory preparation work, it turned out just to be the head and a single articulated segmen t.
The next four days were pretty much the same repetition. Pry at a large chunk of rock using wedges and pry-bars and then break it down into progressively smaller and smaller pieces until you were left with something maybe about an inch by an inch. In a different day and age this would have been considered prison labor. You’d often go hours without a sign of a trilobite, and then maybe hit a pocket and find several within a five minute period. The most nerve wrecking thing is to make sure you aren’t missing any fragments when you do find one. You always try to keep the area around where you are breaking rock clean and never pitch the recently broken rocks away. 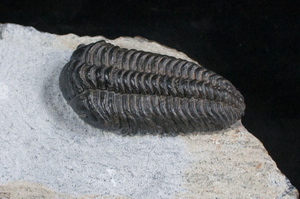 Even then you would often find yourself in a half hour hunt for a missing section of trilobite you just split through. After about 6 days at the quarry it was time to leave and head home. My personal haul included about a dozen phacopids (kainops, paciphacops or reedops), a few Kettneraspis, a Cordania and a couple of potentially really nice Huntonia. Of course, try not to count your trilobites before they are prepared or you’ll often end up disappointed when a trilobite you thought was complete from the field turns out to be incomplete. 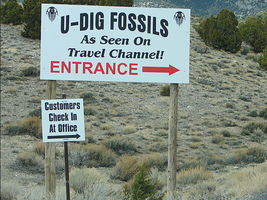 One of the things most people take for granted is that the time it takes to find a fossil often pales to the time it takes to prepare one. Every trilobite found had to be cleaned under microscope using air abrasives (think miniature sandblaster) and air scribes (think miniature jack hammer). 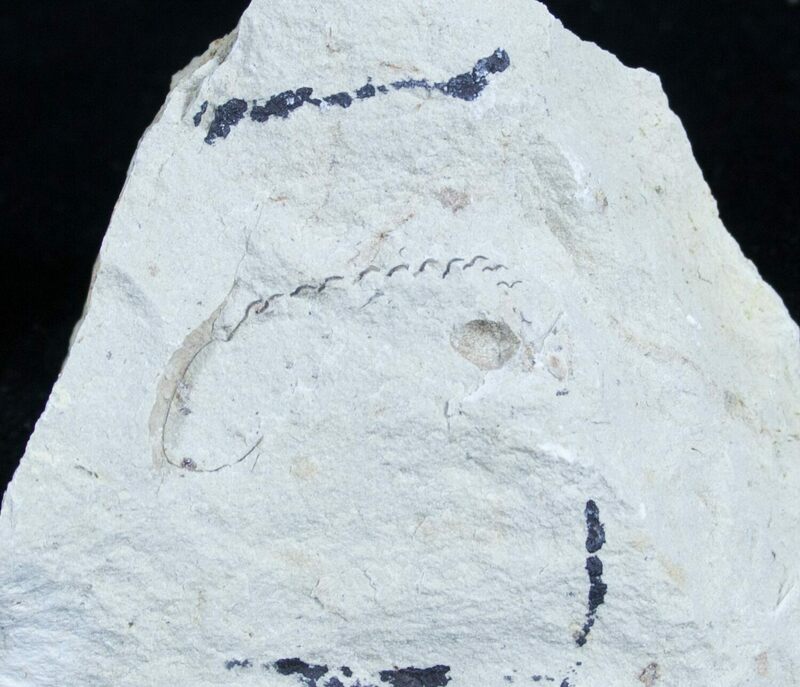 Even for a small paciphacops found in cross section, this process takes several hours and can take dozens of hours for larger or more ornate trilobites. Here's the preparation sequence of a large (3 3/4 inch long) Huntonia which was found in cross section. Exploring to see if it's whole, it is!